NIFT Recruitment 2018: Latest Government Vacancy news for those candidates who want to make their career in the National Institute of Fashion Technology. The NIFT Board has announced NIFT Recruitment 2018 Notification for the Assistant Warden (Female), Steno Grade III and Library Assistant Posts. The NIFT Recruitment Application Form Submission Last date is 24th September 2018. 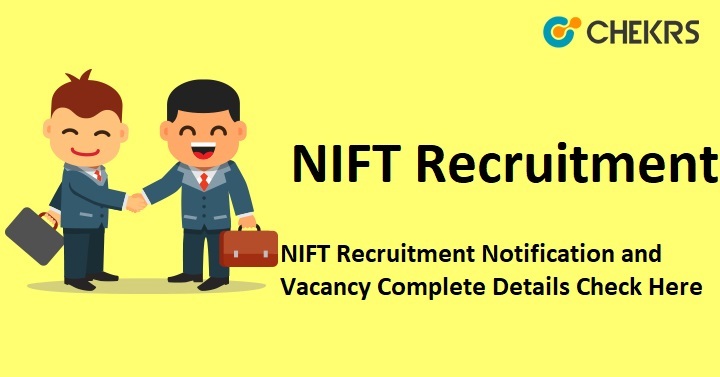 Here, we are giving a detail of NIFT Assistant Warden Vacancy like the number of vacancies, Name of posts, Last date applying for an application form, steps of applying for an application form, Official Website Link. Click “Career@nift” button and a new window will be open. After the click application form and take a printout of the application form. After completing the process, Form & documents send postal address. Payment of application forms through demand draft/banker’s cheque. Remarks: For more information, we can update soon about NIFT Recruitment 2018 and we are providing the latest update related to upcoming Recruitment on our website that is www.jobs.chekrs.com. If you have any query about NIFT Various Vacancy 2018 that you can write comments on commenting box and take a review or feedback.